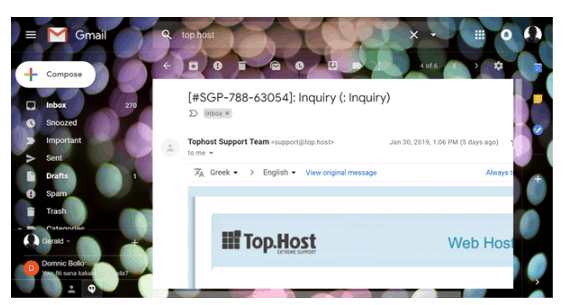 Top.Host Review 2019: Is Top.Host a Good Hosting? Greek web hosting company Top.Host tops off its SSD-based hosting plans with a top-class 90-day money-back guarantee. Top.Host was founded in 2005 and has evolved by adding new features almost every year. Its team is comprised of professional technicians who are dedicated to providing the best services in the industry. The main Top.Host website is in English, but some of the separate support pages are in Greek. 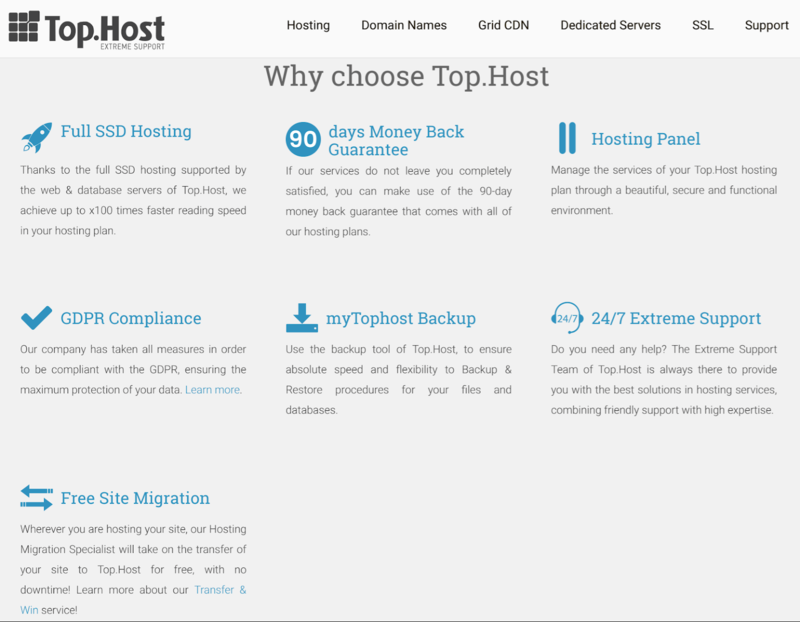 Top.Host offers four web hosting plans. The regular web hosting plans start with standard resources and allow for hosting only one dynamic website, but this can be upgraded to host an unlimited number of websites with additional resources. You get a free domain name, a free Let’s Encrypt SSL certificate and free professional website migration. You also get free DNS management so you can manage records including SRV, MX, NS, and even CNAME. If you out-grow the regular hosting plans and need higher resources and higher availability, then the top-tier “Big Bang” package will be the right fit for you. This comes in three flavors on semi-dedicated servers, which generally feature NVMe disks, spam protection, 24/7 monitoring, three daily website backups, and continuous uptime. Top.Host uses optimized modern technology to provide its customers with secure, elastic web hosting. Furthermore, it has optimized speed and performance using Speed Cache and SSD technology. As an alternative to shared hosting, you can instead opt for VPS hosting with excellent features including remote reboot, a choice of Windows and Linux distributions, and a choice of control panels. This is activated as soon as payment has been made, and the SSD storage ranges from 20 GB to 200 GB on both Windows and Linux VPS plans. Top.Host offers averagely-good prices for its products on one-month to three-year billing cycles, with a discount for a longer term commitment on your first order. You can pay by PayPal, credit cards, Paysafecard, or bank deposit, and you get a very generous 90-day money-back guarantee that gives you a full three months to decide whether you’re fully committed to this provider. Top.Host takes pride in its 24/7 support, which you can access via live chat, ticket, telephone, or email. I got answered almost immediately when I tested the live chat channel. If you want to try supporting yourself, you can take advantage of the video tutorials and the detailed knowledge base which – unlike the rest of the Top.Host website – is substantially in Greek. With data centers in France, the Netherlands, and Germany, Top.Host is a value-oriented web hosting vendor that offers quality hosting services using current technologies for enhanced protection and performance. Wondering how Top.Host stacks up against other Web Hosting companies? Enter any other Web Hosting company and we will give you a side-by-side comparison.